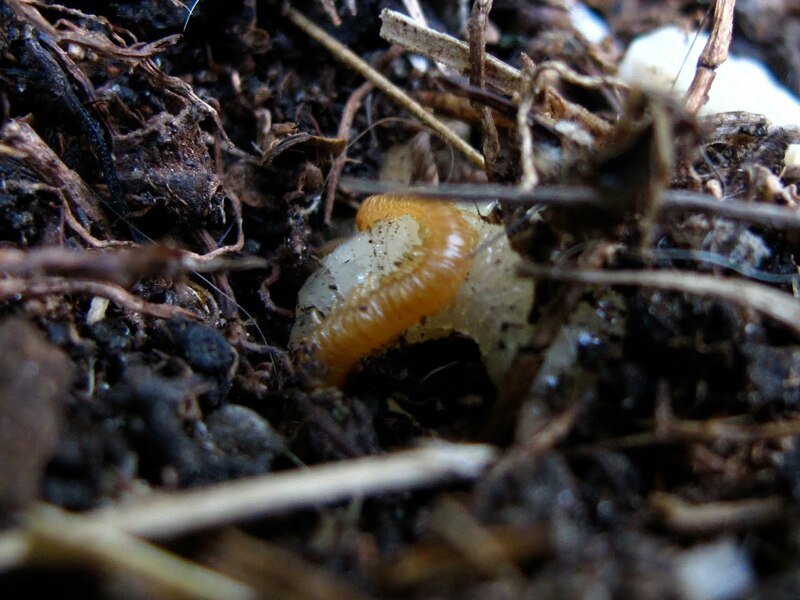 When collecting some compost that had formed on the concrete under a large vine, I came across half a dozen subterranean centipedes. 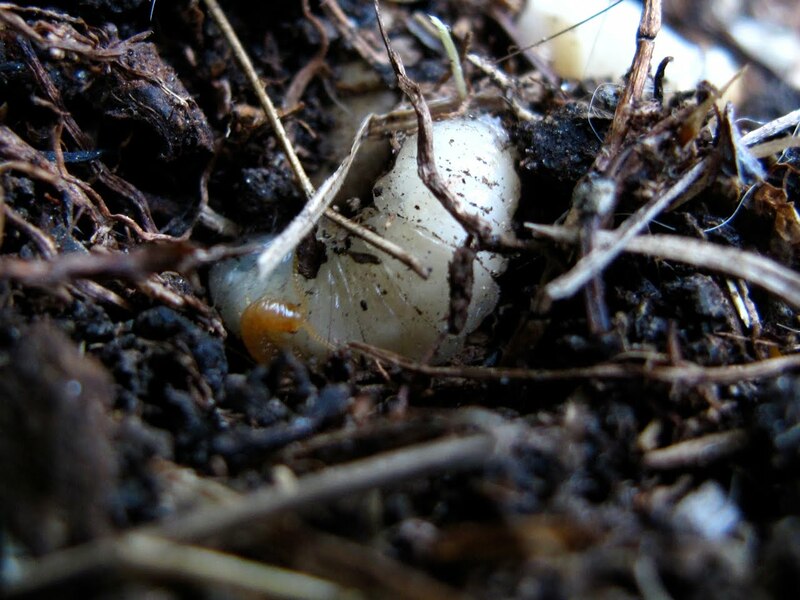 Despite having no eyes, they appear annoyed when exposed and try and hide under the soil as fast as they can, with their antenna moving very fast feeling the way. They are slower than the Lithobius, but their long snake-like bodies makes it quite tricky to get good shots, so I was quite pleased with the one above. This is Stigmatogaster subterranea (previously known as Haplophilus subterraneus), which usually has between 77 and 83 pairs of legs. I counted about 80 on a photo, a bit short of a hundred to deserve the name 'centipede' - which anyway, no centipede has, as they always have an odd number of pairs of legs - but still a respectable number. 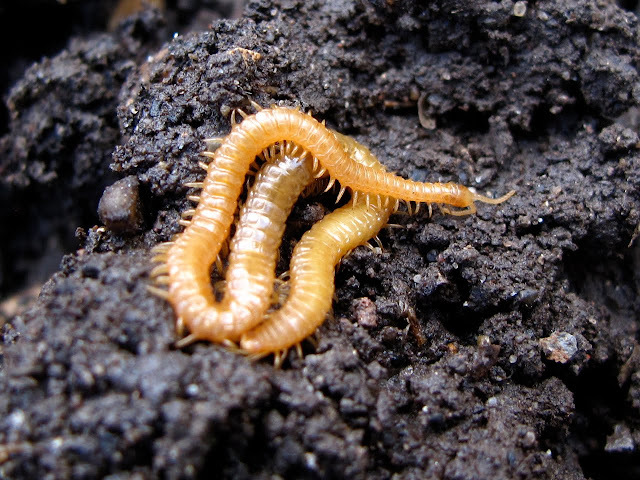 This species is blamed for nibbling roots of crops, and it feeds on vegetal and animal matter, but last year I witnessed a titanic struggle of a grub of some sort with an specimen of this centipede just at ground level. 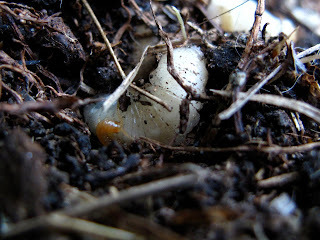 You would wonder how on earth did I happen to notice this, and the reason is that I had just seen a queen bumblebee digging into the soil and I wondered if she was going to make a nest and waited patiently watching until the two struggling pair of bugs nearby on the ground catched my attention. The fight carried on for some time but, unfortunately, I do not know how it ended. It just seemed too large a prey for the centipede. The grub moved its body around and the centipede curled around it, and, as you can see in the photos, tried to bite with its fangs. 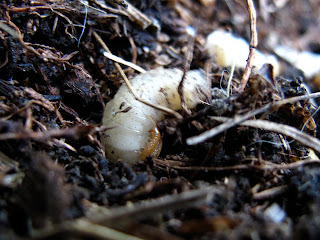 From the photo it appears that either the skin of the grub was too tough or the bite too wide for the fangs to pierce it - and therefore to inject the venom. In any case, it is quite unusual to come across some subterranean bug actually behaving, as opposed to simply disturbing it. The centipede curling around its catch. In this photo you can see the darker fangs opened under the centipede head, trying to pierce the grub. That's great Suz! That's the cool thing about bugs, no matter how small your garden is, or even inside your house bugs are everywhere to see.